korean bbq is a way of life where i go to school. check snapchat on any given day, and you’ll see someone cooking well-marbled ribbons of meat on a table laden with tons of side dishes (or you’ll see people at disneyland for the 16th time this month). even for someone who doesn’t love the taste of meat, it’s paradise. there’s caramelized meat, tons of veggies by way of the banchan (aka the side dishes), tender rice paper, nearly transparent slices of pickled daikon radish and chewy japchae (sesame-rich sweet potato noodles). this kimchi cucumber naengmyeon is inspired by my love for korean food. mul naengmyeon is cold noodle soup with an icy cold (literally; sometimes there’s ice in your bowl), vinegary beef broth. bibim naengmyeon is cold noodles tossed in a fiery, both in color and spice level, sauce. i first tried these one during summer vacation at mo ran gak, though that’s one of the few kbbq places i’ve been to (of the wide range of places i’ve sampled from throughout the bay area and la/oc) that serves naengmyeon. anyways, both mul naengmyeon and bibim naengmyeon are perfect for summer. this kimchi cucumber naengmyeon is a combo of the two, with a spicy sauce that is looser and more liquidy than the typical bibim naengmyeon sauce is. and i’ve subbed in ribbons of cucumber for the usual buckwheat noodles. given the similarity between this kimchi cucumber naengmyeon and the usual naengmyeons, you might think i came up with this one after an enlightening korean meal. nope. try a stats discussion 2+ years ago, upon which it ended up languishing in my (too long) ideas doc for days (years, really). and you thought lower div stats wasn’t useful. anyways. the sauce here is less red than yours might be; it mostly depends on what color your tomato is (when i was photographing this, i had some amazing orange tomatoes), and how red your kimchi is. and another thing: your tomato doesn’t need to be a perfect summer heirloom specimen. it’s just there for some juiciness. you can always add sugar at the end if you find the sauce too sharp tasting. and don’t worry if the final dish is a little watery! that broth/juice is clean and refreshing tasting, and is perfectly delicious (not gorgeous). also: thanks for your birthday wishes! my day was filled with a lack of motivation, chocolate coffee caramel cake, a massive vietnamese broken rice plate, frozen juice soft serve, free beer from the pub on campus (i got the lightest one and it was so yeasty and gross that i passed it off to my friend after a sip lol), and a reservation to go to state bird provisions later this summer with my parents. pretty excited for that last gift! 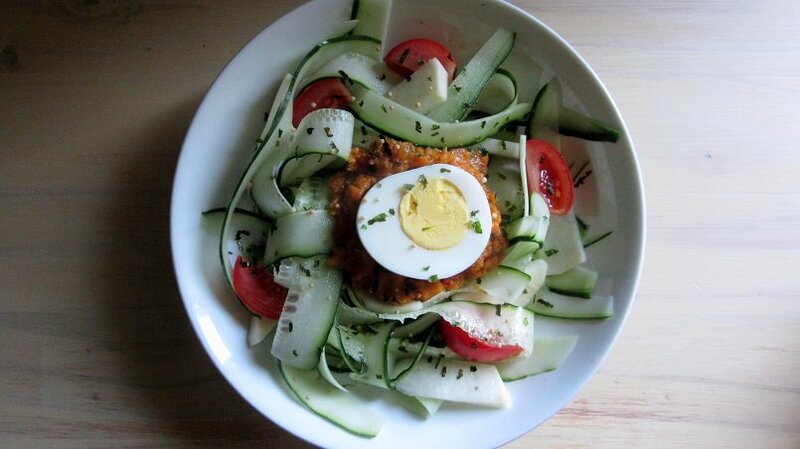 This kimchi cucumber naengmyeon is when you want to cool down (all that raw veg!) and warm up (sort of spicy sauce) all at the same time. Blend half of the tomato, the apple/pear/apple pear, kimchi, fish sauce, sesame oil and soy sauce until smooth. 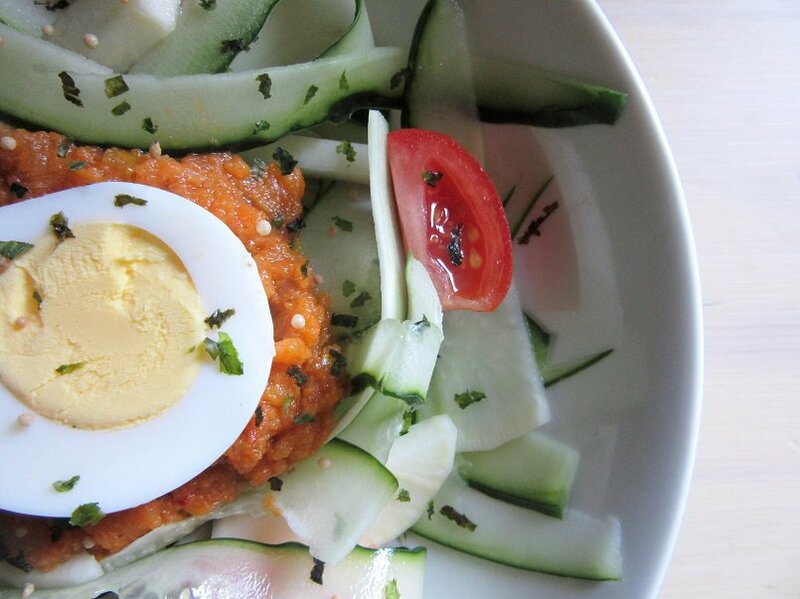 Combine the dressing and cucumber, then top with the egg, daikon and remaining tomato (chopped). You can serve it with other kinds of protein, add watermelon and furikake, or whatever floats your boat. If you want a totally smooth sauce, peel the tomato and apple/pear before blending. You can buy pickled daikon at a Japanese, Chinese or Korean market, you can quick pickle your own. Combine a couple of splashes of white vinegar with sugar and salt, then toss in thinly sliced daikon. Toss occasionally, and you'll have quick pickled daikon in 15-20 minutes! This sounds so delicious and fresh!! I have a whole big jar of kimchi in my fridge that I don’t know what to do with. This sounds perfect! oooh yes this would be good (: if i have a ton of kimchi i need to use up, i eat it with everythingggg but it gets really funky at a certain point, and then i like to cook it (kimchi fried rice is probably one of my favorite ways to use up more fermented kimchi). Confession: I’ve not tried kimchi yet, despite the fact that I LOVE fermented foods. I’ve just been a tiny bit daunted by it. Having said that I’ve got a recipe that uses kimchi which I’ve been dying to try. Seeing this makes me want to try it right NOW. Thanks for the inspiration and reminder. it’s like spicy sauerkraut! but better than sauerkraut (; i’d recommend getting some less fermented kimchi, since that doesn’t taste quite as funky, or maybe even starting with water kimchi, which is not red (aka not spicy at all). not quite the same as the usual kimchi, but a good starting place! This sounds awesome! I love kimchi and while Korean BBQ isn’t a regular thing in my life, I always enjoy it. I’m so glad you had a great birthday! Have a great week, Heather! korean bbq is probably too regular a thing in my life (; there was a time when i had it twice in a week, and oof, that was too much. i had to back off for a couple of months. I have never had kimchi . I love tring new cuisines , I will have to try this! Looks really good! you should!! it’s kind of similar to sauerkraut (but a little bit funkier because there’s usually some sort of seafood, and spicier). This looks so fresh and delicious! I like the taste of kimchi a lot, but I don’t find myself eating it often. All the ingredients combined together sounds so flavourful! i don’t find myself eating it as much either, tbh. in high school, i used to convince my parents to buy a massive costco container’s worth, and i’d basically eat it all by myself, with very limited help from my mom lol. This looks so interesting Heather! So colorful, fresh, and palatable recipe! Can’t wait to give it a try, Heather! 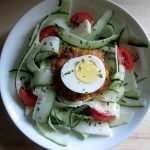 Wow – this sounds fresh, yummy and would be so good for lunch today! I love kimchi! I even just eat it straight out of the container when I’m hungry and looking for something quick. Glad to hear you had a great birthday!! Nice recipe and a happy belated birthday to you! Mmm! I could certainly get along with this – especially if it were topped with some seared tuna! oooh, i love the idea of topping this with seared tuna! especially if it was crusted with sesame seeds, mmmmmm. Can I confess that I love the little side dishes at Kbbq more than the meat itself! Lol I am not sure if I have tried naengmyeon, but cold noodles in hot sauce sounds amazing. 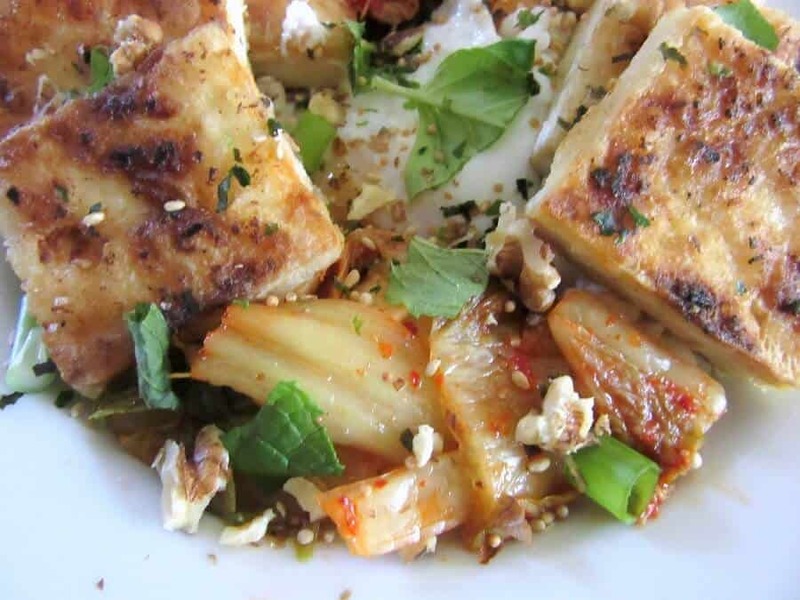 Great use of Kimchi! i agree with you 33904%! i’m the person who probably isn’t getting her money’s worth at all you can eat bbq because i’m always asking for seconds of the banchan, which is definitely cheaper than the meat. My mouth waters when I read your posts! I love Kbbq, trying to find a good one here in the PNW, and always love anything with kimchi. 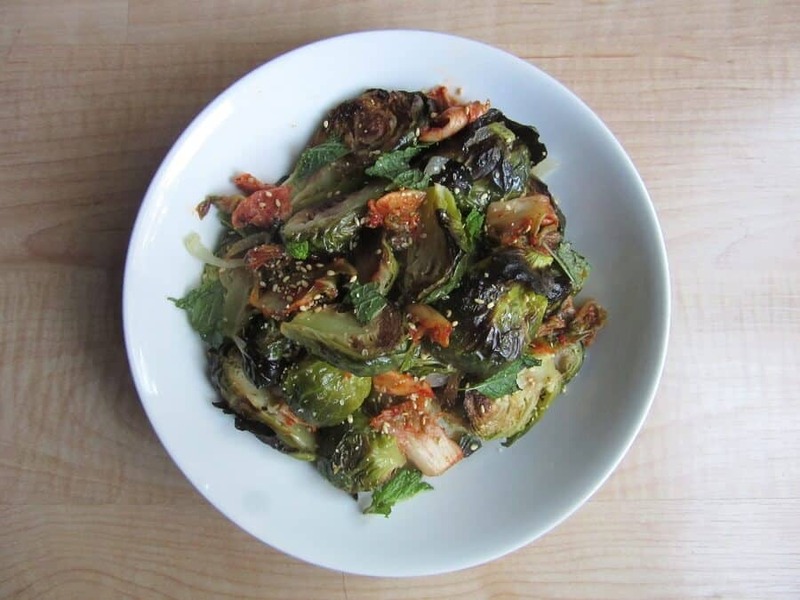 I’m tempted by this dish, and also the Brussels sprouts that appear at the end of your post. Can’t wait to try them! not sure where there’s good kbbq in pnw, but i’m sure you can find something! if you ever need bay area/southern california kbbq recommendations though, i can help (; ooh yes those kimchi brussels sprouts are also really tasty! maybe a bit hot for spring/summer because those brussels sprouts get roasted. or not, i’ve heard it’s pretty cool in pnw until june/july! oh yes, i munch on cucumbers plain and am perfectly happy with that (: let me know how you like it if you try it! So fresh and delicious! This recipe is perfect for the warmer months to come. I find that the side dishes at Korean BBQ are phoenominal. I don’t eat meat but am always able to have a great meal when I go with friends. I went to ny first authentic Korean restaurant last week in Boston and it was amazing!! I love the sweet and spicy flavor combinations. I wish I was lucky to live next to one like you. This dish looks amazing!! And a great way to get those flavors at home. I love this! I’m just getting into the kimchi craze! I used to have Korean BBQ a lot when I was in University. This dish looks so light and fresh. Yum! oh, this broken rice plate was unreal. it was $12 for a 7 item plate, and more than enough food for a friend and me. there were a lot of bouncy things (fish cake and shrimp cake and i think some sort of sausage), steamed egg, grilled pork, shredded pork, cucumbers, pickled cabbage, and something else that i can’t remember. so. worth. i get into those obsessive moods too :3 i think i’ve lived off of ants on a log, and parmesan eggs alongside buttered toast this week haha. This looks like everything I am craving right now. So fresh so yum! yes, super fresh (: thanks ruby! This sounds like a great idea, and so easy to make too! Perfect for a light lunch. Your descriptions of kbbq is making me really hungry and I just finished breakfast. So excited for your SF trip. Hope you enjoy! I know you may not love the taste of meat or even eat it that often but I think it’s just delicious. This comment isn’t about me though, I just had to get that out there, don’t hate me heather lol =p ok that corniness aside, the naengmyeon looks so tasty. I don’t eat enough kimchi or anything making it sauce but this bowl makes me realize I need to. Oh and glad you had a good birthday!!! meat is the one thing i don’t have trouble eating in moderation (bets off for fruit, carbs, dessert, etc etc). but i wouldn’t complain if some bulgogi appeared on top of this (: ahh i definitely don’t eat enough kimchi either (i know because whenever i get korean food, i hoard most of it. oops). All my friends from the Bay who went to school in Southern California say that’s where all the good Korean bbq is. I swear I could probably find a way to put kimchi in everything I love it so much!